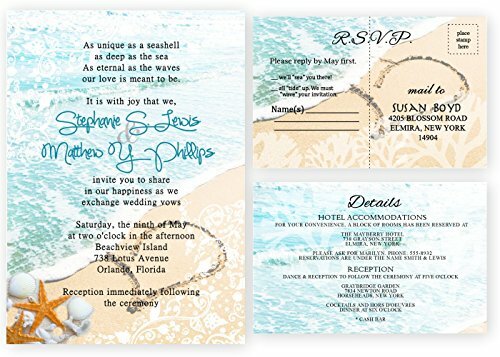 Beach Wedding Invitations Starfish Theme - Set of 30 5x7 invitations 30, 30 white invitation envelopes Beach starfish theme wedding invitations with heart in the sand and waves in the background. MATTE FINISH. These are Flat printed. Printed in beautiful colors on thick bright white cardstock. These wedding invitations have a beautiful matte texture. Invitations measures 5x7 and RSVP/Cards are smaller. The wording can be personalized as well as the name color. These wedding invitations have a beautiful texture. Colors and wording can be personalized. I can also adjust the fonts if needed. Graphic elements can be changed, added or removed. I will be happy to change all aspects of this item to suit your needs and theme. Once I receive all the necessary information I need to complete your order, I will send a preview for you to review within 24 hours or less. Items will not be printed until we receive your proof approval. You can make as many changes to the proof as you like. If you do not receive your proof, please check your bulk and spam folders. 7-10 day processing / printing time after you approve your proof, and then your item will ship via USPS. Items will not ship until your proof/preview has been approved. If you do not send us the required information needed to complete your item, this may delay your order. Please be sure to send accurate personalization details and respond promptly to the messages we send through amazon. You should receive notification that your item has shipped. In case you do not, please check the tracking details under your purchase history before contacting us for shipment information. If you have any questions about this product by New York Invitations, contact us by completing and submitting the form below. If you are looking for a specif part number, please include it with your message.